Mary Virginia Wade – better known as “Jennie Wade” – was the only woman shot and killed at Gettysburg. Or so the story goes. But is it true? What if there were other female casualties at Gettysburg? Women in the direct line of battle fire? Not civilian “by-standers”? At least five other women were shot at Gettysburg. They weren’t civilians. They were soldiers. This is what is known about them. Some books and history events seem to give the impression that half the soldiers in Civil War armies were female. That’s not true, but serious historians should acknowledge the presence of female soldiers in the 1860’s armies. It was a very controversial and semi-dangerous step for a 19th Century woman to wear male clothing and masquerade as a man, but some did. Motivations varied; some women followed husbands or lovers into the army, others were seeking patriotic adventure, and many were taking an opportunity to make a “silent statement” and rebel against the traditional female role. Details about female soldiers during the Civil War are not plentiful. Most kept their service secret, though some eventually revealed their adventures with the barest details. A couple of women wrote and published their accounts, usually implying a quasi-feminist statement. 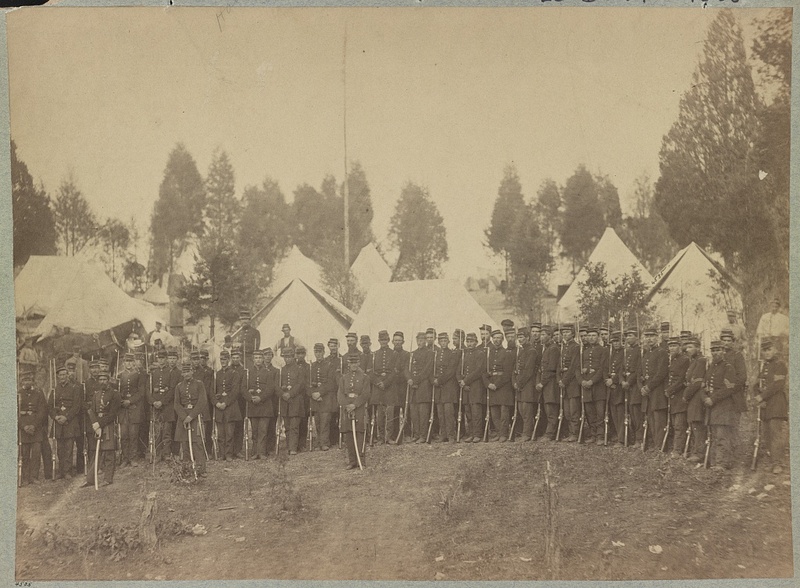 Photography of a Civil War Regiment (LOC). Were there any unidentified female soldiers in this unit? There were five female soldiers who were “discovered” at Gettysburg. Likely, more women were hiding in the ranks – possibly even buried – without revealing their secret. Unfortunately, the information about these five is quite limited, and many unanswered questions remain. The known information about the two Union and three Confederate girls is a fascinating glimpse into a mysterious part of Gettysburg and the entire war. A Rebel girl was revealed in a field hospital where she’d been carried with a serious wound. Her plight amused and astonished the male soldiers at the base hospital; one wrote to his parents about the incident. (The spelling is original.) “I must tel you we have got a female secesh here. She was wounded at Gettysburg but our doctors found her out. I have not seen her but the[y] say she is very good looking. The poor girl [h]as lost a leg. It [is] a great pity she did not stay home with her mother but she get good care and kind treatment. It [is] rather romantic to have a female soldier in the hospital and her only to have one leg and far a way from home but I hope she will soon get better and get home to her friends.”[iv] This un-named Rebel girl did recover and was quietly sent to her family in the South…without any recorded romantic escapades. 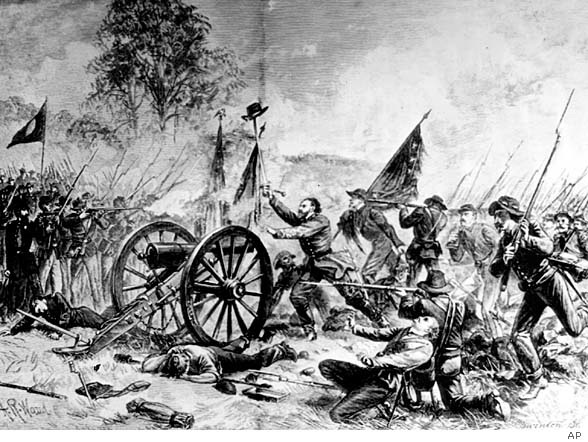 An artist’s depiction of Pickett’s Charge. At least two Southern women made the fatal march. While four female soldiers’ identities were discovered while they were alive, the third Confederate female soldier was not identified as a woman until after her death. Her body was found near the stonewall at The Angle by a Union burial detail. At the end of Union General William Hays’s Gettysburg report, he noted the burial of the Southern dead. One terse sentence records the female soldier: “Remarks: one female (private) in rebel uniform.”[vi] Nothing about her age, appearance, or the reactions of the men who found her. Thus, Mary Virginia Wade was not the only woman shot or killed at Gettysburg. It is also possible she was not the only civilian to die during the battle either; though the evidence is not conclusive at this point, another Gettysburg civilian woman may have died during the battle days from complications of childbirth. For those wishing to have an accurate answer for “Jennie” Wade’s death, here’s a suggestion. “Mary Virginia Wade was the only known civilian woman killed by a military projectile during the Battle of Gettysburg.” That’s citable with historical facts! The brief accounts of the five female soldiers at Gettysburg present more questions for historians to follow. Maybe – just maybe – more details will be discovered about those women or others still “undiscovered” in the 1863 ranks. Long overshadowed by Miss Wade, these five women were remarkable for their courage and patriotism. Whatever motivations brought them to the battlefield, they were brave and extraordinary in their commitments and beliefs. [i] Eileen F. Conklin, Women at Gettysburg, 1863, Revisited (2013), Page 152. [vi] Eileen F. Conklin, Women at Gettysburg, 1863, Revisited (2013), Pages 152, 451. This entry was posted in Battles, Civilian, Common Soldier and tagged 19th Century Women, Confederate women, female casualities at Gettysburg, Female Soldiers, Gettysburg, Jennie Wade, Mary Virginia Wade. Bookmark the permalink. Somewhere I saw a comment there were more women soldiers in the Civil War than there were Black Confederates! A friend and I were talking one time about women soldiers. No question they existed but how did they avoid discovery? To use an obvious example, girls go potty in a very different and obvious manner than do boys. Then the friend had the answer: when he and I joined the military, we went off to basic/boot camp among strangers. For the past century or more soldiers are among strangers from their enlistment to their discharge (to say nothing of the medical exam done to new recruits). But in the Civil War, one went off with neighbors: everyone knew everyone else in the company, whether they wore blue or gray. Which means the women *were* known to their comrades from day 1. Which puts an entirely different light on who these women were and their relationship with their fellow soldiers, their neighbors and friends. Avoiding detection may have been easier than we tend to assume. Lauren Cook Burgess in “An Uncommon Soldier” notes that people in the mid-19th-century would have just assumed that a person wearing male attire was male; they simply couldn’t imagine otherwise and wouldn’t have thought to check. Yes, recruiting from specific areas does raise the question, how many of those soldiers knew their comrade was a woman? It probably varied case by case. I think Will makes a good point mentioning that it was just so unexpected that most guys probably didn’t even think to question. Also, the young ages allowed in the ranks (legally as drummer boys, or when the recruiter “turned a blind eye” on the age or believed a lie) probably made it easier. The role of a shy, young man could’ve shielded some of the women from scrutiny. The loose-design of the basic uniform certainly worked to her advantage. As for the *ahem* physical challenges? That would’ve been difficult. I suspect each disguised soldier had her own way of over-coming, hiding, or persuading others to keep her secrets. To me, the most interesting case of a disguised female soldier is from the Napoleonic Era. At Waterloo (1815), a burial party found a female cavalry lieutenant on the field. A lieutenant? In the French Imperial Army? In a cavalry uniform which was either part armor or very form-fitting (depending on the unit)? That’s a real mystery to me! Thanks for bringing to light the other ladies at Gettysburg. I read about an Austrian noble lady, who was the Colonel of a Cuirassier Regt. She took her husband’s place when he died. She was not disguised as a man. There are photos of Prussian Pricesses Louisa & Cecile in hussar and dragoon uniforms, with long dresses, pre WWI.. I read of a young lady (laundress?) with a Union battery at Gettysburg, whose cheerful attitude under shot & shell, inspired the gunners. Afterwards, they made her honorary Sergeant! I have looked and looked, but cannot find the passage, and thus get her name.